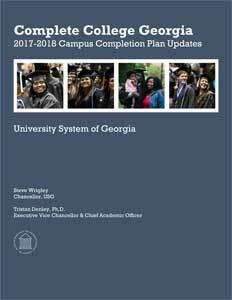 Each year, Institutions across the University System of Georgia report on their progress toward meeting the governor's college attainment goals for the state. In 2017-2018 Institutions across the University System took major steps forward in supporting the state's attainment goals through planning and development around the Momentum Year. While Georgia’s colleges and universities provide a wide range of programs to meet the state’s diverse needs, each tailored to their insitutional mission and student body profile, taking a Momenutm approarch to student success ensures that these activities provide a coheernt, comprehensive, and student-focused approach that is supported by the best research and data avaialable. The report for each institution highlights the diversity of challenges and innovation that continues to mark Gerogia as a national leader in supporting students as they work toward their college aspirations. Among the highlights from 2017-2018 are the significant strides institutions have made to advance the academic progress of students with learning support needs, the increasing focus on advising and analytics to inform student decisionmaking, and the inccreased use of program maps, fuller schedules, and analytics. This year's updates underscore insitution's commitments to using data to measure their progress and make adjustments as they go. As illustrated in the report, the institutions of the University System of Georgia in partnership with the Technical College System of Georgia, the Georgia Department of Education, and the state's private colleges and universities, are addressing the needs of Georgia's citizens and businesses to be competitive and strong.